A second bookable offence led to red for Portstewart's John Neill at Planters Park on Saturday in the 1-1 draw with Dollingstown. Pic by PressEye Ltd.
After almost 10 months of fixtures and hundreds of miles, the Irish League destiny of Dollingstown and Portstewart will be defined by 90-plus minutes of football on the final Saturday of May. The full focus of both clubs is going to centre on events within the four white lines of the Seahaven pitch this weekend that hold far-reaching implications beyond those dimensions. A spot in the third tier of the Irish League is the first prize at the final whistle of the play-off second leg. Portstewart left Planters Park last weekend a man down due to John Neill’s late red card but with the upper hand overall as the dancing feet and decisive finishing of Ryan Doherty provided the visitors with a vital away goal. Dollingstown’s early advantage had been gained thanks to Jack Clarke’s angled strike but it proved a rare moment of celebration against Portstewart goalkeeper Lukasz Bednarz. 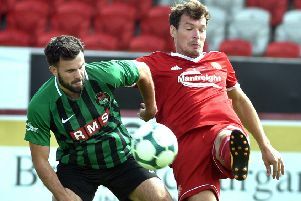 The former Poland schoolboy international produced a string of fine first-half saves that served to increase the sense of frustration at the final whistle for Dollingstown at an inability to cement control despite the greater attacking threat and numerical advantage on the field following Neill’s dismissal. With the rare but significant added weight of an away-goal edge and home advantage on hand, Portstewart can feel increased confidence. Dollingstown can look at a greater number of wins on the road than at home as a lifeline - with the caveat they must now breach a backline boasting one of the best defensive records in intermediate football. Portstewart’s treble trophy success against the double delight enjoyed by Dollingstown puts both clubs in the final fixture experienced in the art of game management required to get over the line when it counts. Now the scouting reports can give way to personal experience of each rival player as both clubs will gain from having turned theory into practice. Dollingstown can draw from a number of attacking opportunities created - a strength which can only increase in the absence of the commanding Neill from the Portstewart defence - plus ability to restrict the Portstewart attacking unit. In contrast, Portstewart can prepare for the second leg lifted by a well-earned draw built around moments of magic from Doherty and the foundation of an away goal thanks to a disciplined display that suggested a gameplan developed for two ties towards one end goal. The fixture’s unique position in a sporting calendar traditionally dominated by cricket at this stage of the year led to a bumper crowd, including players and managers from a string of Irish League clubs. One disappointment was the lack of referee’s assistants, with Dollingstown officials citing an unsuccessful request to the Northern Ireland Football League. The pre-match preparations featured one show of camaraderie as a kit issue led to Portstewart playing in Dollingstown’s away strip. The post-match press conversations by both managers also proved united as Gary Taylor and Stephen Uprichard each talked of higher standards capable from the players and the high stakes of Saturday’s single result settling a season of high hopes and hard work. DOLLINGSTOWN: Stephen Croft, Jake Redpath, Nathan McConnell, Glen Hand, Neil King, Aaron Moffett, Jack Clarke, Martin Hughes, Scott McCordick, Josh Norton, Richard Thompson. Subs: Scott Adams, Jason Rogers, Gregg Harrison, Chris Coleman, Michael Denver. PORTSTEWART: Lukasz Bednarz, Lee Forgrave, Richard Vauls, Karl Steele, John Neill, James Peden, David McClements, Patrick Gault, Eoghan Quigg, Chris Hanson, Ryan Doherty. Subs: Jordan Pollock, Josh Rohdich, Luke Bradley, Josh Dunne, Gary Taylor.